John Mix Stanley’s status as a major depicter of Native American and Western American life was imperiled by a catastrophic loss of his work, but enough remains to reveal his true importance. John Mix Stanley, Group of Piegan Indians, 1867, oil on canvas, 27 x 41 inches. 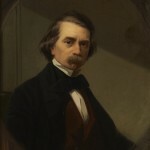 John Mix Stanley, Self- Portrait, circa 1860, oil on canvas, 29 x 24 inches. John Mix Stanley, Scouts along the Teton River, circa 1855, oil on canvas, 24 x 34 inches. In 1865, John Mix Stanley’s Indian Gallery was destroyed by fire. 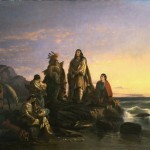 A massive installation of 150 portraits of Native Americans, made from life during the artist’s travels on the Western frontier and supplemented by maps, documents, and artifacts, it had been on loan to the U.S. government for 13 years, displayed at the Smithsonian Institution’s gallery in Washington, D.C. All but seven of the paintings burned, a devastating loss that contributed significantly to Stanley’s later obscurity. 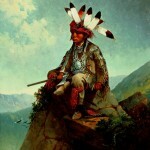 Today, he is overshadowed by contemporaries such as George Catlin, Alfred Jacob Miller, and Karl Bodmer. However, Stanley was no defeatist; after the fire, he kept right on painting, and throughout his career, in addition to the Indian project, he created a large body of work that included portraits, genre studies, and historical canvases, much of which survives. The best of Stanley’s work combines an extremely polished Hudson River School technique with close observation of Western life—Native and Anglo alike—that verges on the anthropological. 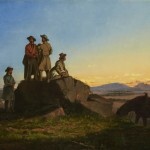 In paintings such as Indian Telegraph (1863), Scouts along the Teton River (circa 1855), and Mounted Surveyors and Pack Animals (1854), the artist exploits the pictorial possibilities of the landscape to the fullest, using sunset light and distance haze to heighten the emotional impact. Meanwhile, the figures are precisely delineated as to costume, accoutrements, and any other elements that could give an air of ethnographic authenticity. While there can be no doubt that Stanley was a Romantic painter as well as a businessman who cannily calculated the public’s taste, he also cared very much about accuracy and felt he had a duty to make a visual record of traditional Indian life and culture before it was too late. was very prevalent in Stanley’s time and after—to the point of being taken for granted. For politicians and the military, the “vanishing Indian” trope was a helpful propaganda tool to justify any depredations on Indian lands. For writers and artists it was often the occasion for saccharine sentimentality, as in Stanley’s The Last of Their Race (circa 1857), a huge canvas in which seven exhausted-looking Native Americans despondently sit by the Pacific coast. Some are gazing longingly back at the lands they left behind, while one stares out to sea and the others just look downward, depressed. The sunset lighting is now heavy-handedly symbolic. In this picture, the Indian is the recipient of pity without outrage, pushed by advancing white “civilization” all the way to the continent’s Western edge; at this point, they might as well jump into the ocean and be done with it. However, for Stanley, the belief that the Indians were a “dying race” was also a powerful impetus to create other kinds of paintings, in which Indians would be depicted accurately and without stagy sentiment. Like Catlin, he genuinely wanted to document Native American life and culture and felt that he was under time pressure to do so—which was realistic given the rate at which physical and cultural violence was affecting Indian communities across the continent. In the 1840s and ’50s Stanley traveled extensively—over 8,000 miles in Oklahoma Territory, Texas, California, New Mexico, and the far Northwest—in search of real information and visual impressions of a wide variety of Indian tribes. (He also spent a year in Hawaii, during which time he painted the royal family, among many other things.) With camera and sketchbook he collected the raw material for paintings he created once he arrived back East. The Indian Gallery was a passion project that Stanley saw as far more than just entertainment. The Indian Gallery took form in the shadow of Catlin’s Indian Gallery, a similarly ambitious collection of paintings that was also ill-starred. Comparisons between Stanley and Catlin are inevitable. Both grew up around Indians in rural areas of the East—Catlin near Wilkes-Barre, Pa., and Stanley in Canandaigua, N.Y., in the Finger Lakes region. Both died in the same year, 1872. Both were artist-explorers who did not confine themselves to the studio. Both had bad luck—Catlin tried in vain for years to get the U.S. government to purchase his Indian Gallery, bringing financial disaster on himself and eventually being forced to sell off the paintings. Stanley also failed to convince Washington bureaucrats to buy his Gallery; they agreed only to a long-term loan, which of course ended in another kind of disaster. But there are important artistic differences between the two men. Stanley was, quite frankly, the superior painter. Catlin was self-taught, arguably a “primitive” artist whose ambition drove him to make the most of his limited skills, whereas Stanley was trained, first as a house and sign painter in upstate New York and then as a portrait painter in Detroit, which became his home base for the rest of his life. 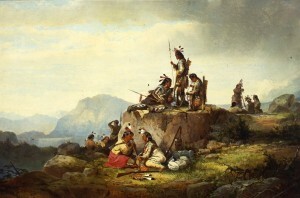 In terms of their approach to their subject matter, Fry says, “Stanley treated Native Americans more as artistic inspiration, as subjects for art,” whereas Catlin had a more “ethnological-anthropological intent.” However, a contemporary, the U.S. Army officer and artist Seth Eastman, who himself had traveled widely in the West, rated Stanley higher for both art and accuracy. 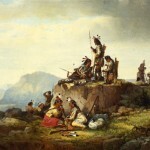 In 1852 he wrote to Stanley as follows: “Having been requested by you to express my opinion as to the comparative merits of yours and Mr. Catlin’s Paintings of the Indians of this country, it affords me pleasure to say that I consider the artistic merits of yours far superior to Mr. Catlin’s; and they give a better idea of the Indian than any work in Mr. Catlin’s collection.” Fry adds that in terms of presentation, Stanley’s Indian Gallery was more guided by aesthetic concerns than Catlin’s had been. “Stanley’s Gallery was a dense 19th-century hang,” she says, “but the paintings were different sizes and the works were presented individually, instead of Catlin’s style,” in which the pictures were arranged in a continuous grid, as if they were specimens. The year after the Stevens expedition, Stanley, then 40, married Alice Caroline English, a schoolteacher. Thereafter he would no longer be a Western explorer but settled down to the life of a studio artist in Detroit, executing commissions for a wide variety of patrons and also setting his Western impressions down on canvas and other media. One of those media was a panorama in 42 panels titled Scenes and Incidents of Stanley’s Western Wilds, which debuted in Washington, D.C., in 1854 and traveled up and down the East Coast. During the Civil War, Stanley and several other artists created an even larger panorama of 77 scenes from the conflict, called Polemorama, which also traveled widely. Stanley’s inclination to work on a grand scale found expression in one of his most famous paintings, a bravura performance from 1868 titled The Trial of Red Jacket (in the exhibition). All the apparatus of 19th-century history painting are brought to bear. The great Seneca chief and orator occupies center stage, his buckskin cloak hanging off one shoulder like the toga of a Roman senator. All around him, in a clearing in the upstate New York woods, is a large assembly of Indians, each one meticulously depicted in characteristic garb. Despite its essentially static nature, the scene has great drama; one can almost hear the man speak and sense the hush of the listening crowd. The deep green forest surrounds them all in the embrace of nature, and a space between the dense trees allows a shaft of light to illuminate Red Jacket. The choice of subject was resonant for Stanley, since he grew up in Seneca territory and his family was personally acquainted with Red Jacket. When the future artist was a little boy, the aged Indian leader supposedly held him in his lap.